I guess Roger thought that this movie was just too long. He said in his review "Sergio Leone's Once Upon a Time in the West is a painstaking distillation of the style he made famous in the original three Clint Eastwood Westerns. There's the same eerie music; the same sweaty, ugly faces; the same rhythm of waiting and violence; the same attention to small details of Western life. There is also, unfortunately, Leone's inability to call it quits. The movie stretches on for nearly three hours, with intermission, and provides two false alarms before it finally ends. In between, we're given a plot complex enough for Antonioni, involving killers, land rights, railroads, long-delayed revenge, mistaken identity, love triangles, double-crosses and shoot-outs. We're well into the second hour of the movie before the plot becomes quite clear." Roger also didn't like Claudia Cardianale's performance too much. He said she "was a good choice for the woman, but Leone directs her too passively; in Cartouche, she demonstrated a blood-and-thunder abandon that's lacking here. " This is a movie that is rated 8.8 on IMDB and a 98% rating on Rotten Tomatoes. Probably a little bit better than a 2 1/2 star movie. You know, agree with Roger's criticisms to a large degree. But I still love this movie. Nobody's perfect, including Elbert. The movie is a masterpiece, one of the best films ever made. 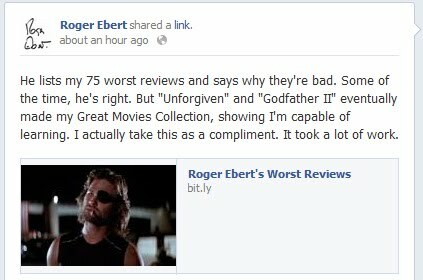 Ol' Roger must have had a hitch in his giddyup the day he reviewed the film because his criticisim sure threw a shoe. I understand he later revised his thoughts on the matter and recognized the movie's outstanding qualitative.